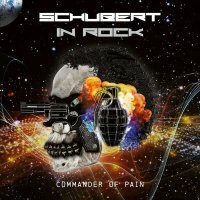 'Commander In Pain' is the second release by Schubert In Rock, the project created by Austria's Heavy Metal legend Klaus Schubert, he of No Bros fame; no, I'd not heard of them either. The debut featured a long list of the great and the good of the genre who re-recorded a selection of No Bros' back catalogue, but this time around, the material is all new and each track was apparently tailored to the individuals performing it. Aside from a couple of examples, it has to be said that they've achieved that goal and it works well. The core band consists of Schubert (guitars), Walt Stuefer (vocals), Andy Marberger (bass), Bernie Welz (drums) and Andy J. Brunner (keys). However, the guest line-up is a veritable who's who of Rock with Marc Storace (Krokus), Don Airey (Deep Purple, Gary Moore, Rainbow), Jennifer Batten (Michael Jackson), Carl Sentance (Nazareth), Jeff Scott Soto (Sons Of Apollo, Talisman, W.E.T., Trans-Siberian Orchestra), Doogie White (Rainbow, Michael Schenker Group), Michael Vescera (Malmsteen, Obsession, Loudness) and Dan McCafferty (ex-Nazareth). If that doesn't give you a clue what to expect, then nothing will. Soto lends his inimitable tones and gravitas to the opening number 'Empathy' which rocks along pleasingly like a Talisman/Purple hybrid with its strong riff and chorus. Later on, he also excels on 'Forgive Me When I Fall' with its slightly funky edge; it's one of my album highlights. Next up is 'Burning Heart', featuring Storace on vocals, and the refrains sound awfully familiar in places and the vocals aren't a patch on the previous number. The opening of 'Little Boy' takes the tempo right down and uses an almost Gospel-like choir approach before the song kicks it up a few gears. McCafferty's vocals on 'Too Late' are frankly awful and therefore spoil what could have been a classic early Whitesnake type number. His other contribution, 'Our World', equally deserves the "skip" button unless Brian Johnson (AC/DC) style vocals are to your taste. White and Airey lend their talents to the rather tasty 'Under The Lights' which reminds me of Saxon crossed with Rainbow. 'Dance Of The Black Tattoo' is a fine, mid-paced number with some great riffing and decent soloing, while the title track features more wonderful Hammond Organ work from Airey. The closing number, 'My Name Is Judas', has another splendid vocal from White.